All homemade yogurt is surprisingly easy to make. But most people make one of the heated (thermophilic) yogurts. These are what we would normally think of as traditional yogurt (Greek or Bulgarian style yogurts) They are made by heating and cooling the milk, inoculating it with a yogurt culture and then keeping it at 110 degrees for a few hours to ferment. Although this is fairly simple and makes a delicious yogurt, I sometimes find the heating and temperature requirements to be a pain. 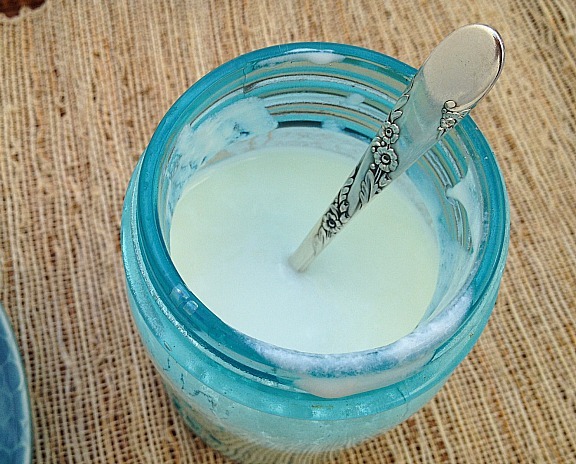 You can make a delicious yogurt at room temperature. Yep, room temperature. No heating or maintaining a temperature. All that is required is an heirloom yogurt culture from the mesophilic class of yogurts. (More on that below). There is no need to heat the milk – at ALL! It can be reused to culture the next batch -Indefinitely! Everything you need to start is in the post below. How is Traditional Yogurt Made? It helps to first understand how traditional or thermophilic (heat-loving) yogurt is made. This type of bacteria only grows or cultures at about 110 degrees. So this means that to make it, you go through a process of heating and then cooling the milk to 110 degrees. You inoculate it with a yogurt culture and then keep it at that temperature for a few hours to ferment. You do this in either a yogurt maker or some other warming device like a warm oven, etc. At that temperature, the culture consumes the milk’s sugar, multiplies and magically converts the milk into yogurt. Mesophilic refers to the fact that the bacteria thrive at moderate or room temperature conditions. This type of yogurt creates the same transformation of milk to yogurt, but it is able to do it at room temperature (70-78 degrees F). If you go too much above or below that, the cultures will do nothing at all. Mesophilic yogurt has all the same benefits as traditional yogurt and a similar tangy flavor. But it has a thinner consistency. I use a Viili culture because I like the flavor and consistency of that particular strain. The fact that it is thinner does not bother me because I use it in smoothies. But it certainly thick enough to eat with a spoon with fruit. You get different flavor (tartness) and consistency (thickness) based on the yogurt culture you use and how long it ferments. You can also get different characteristics based on the milk you choose to culture in (whole vs. low fat, etc.). Also, the longer you let a yogurt culture, the more tart it will be. But if you let it ferment too long, the yogurt will begin to separate into curds (solids) and whey (liquid). Where Do You Buy These Cultures? I get mine at Cultures for Health. They are high quality and reliable. Plus, they have lots of information on how to use them. But there are many other sources on the Internet. Listen, you will be leaving perfectly good milk out on the counter for 12-48 hours. If you are a newbie, this can feel a little weird at first. You may even worry that you will poison your family! If it is a healthy culture, it will immediately take over the milk and begin to turn the milk sugar to lactic acid. This acid environment is safe and free from things like botulism. But even if something goes wrong, you are not going to get botulism from this. During fermentation, the milk is not sealed in a jar. So you are working in an aerobic environment (oxygen is present), making botulism a non-issue here. Once you make your own yogurt on your counter, you will feel victorious – in a rebellious sort of way. I make viili yogurt with whole, organic, pasteurized milk. You can’t use ultra-pasteurized because it is too sterile and won’t work well. But the milk can be homogenized or non-homogenized – your choice. You can use low fat milk, but the consistency will be even thinner. Although you can use raw, goat and even nut milks to make yogurt, the steps are a little bit different. For the sake of a shorter post, I am only describing cow’s milk here. Purchase a Viili starter. I get mine from Cultures for Health. 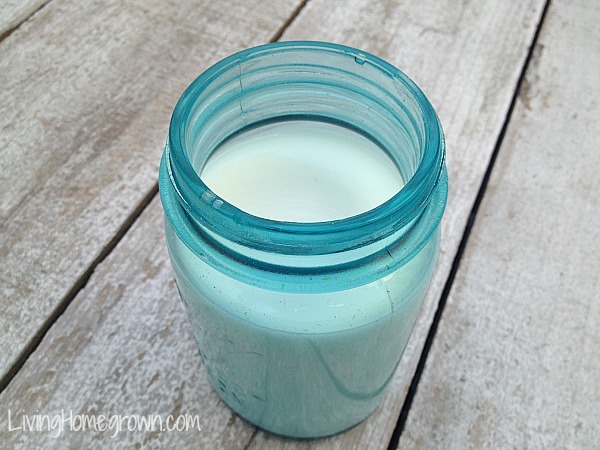 Pour your milk into a clean jar. I use my vintage canning jars for this because they look so lovely on the counter. 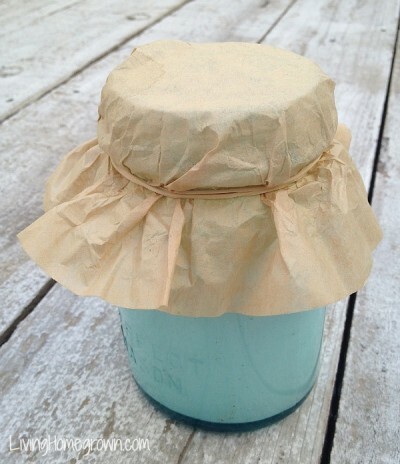 Add a coffee filter or cloth over the top to keep out bugs. Use a rubber band to hold it in place. Let the mixture sit for 12-18 hours until it sets. (During your initial fermentation and the creation of your first starter, it can take up to 48 hours. But should only take about 12-18 hours during subsequent ferments.) The time varies depending upon the strength of your starter and the temperature of the room. You will know it is done when the yogurt will pull away from the sides and is thickened. At this point, put it in the refrigerator for 6 hours to set, firm up and stop the fermentation. After that, you can eat it! Remember, this type of yogurt culture can be used over and over again…indefinitely. This means that if you keep this culture alive, you never have to buy yogurt again. To keep your culture viable, you must try to make your next batch of yogurt within 5-7 days. After that time frame, the culture will start to die off and may not be healthy enough to re-culture. If you get into a routine, it’s not too difficult. I make my yogurt every 7 days on the weekend. To make your next batch, add one tablespoon of your previous yogurt for every 1 cup of milk. For example: 2 tablespoons of yogurt would be mixed with 2 cups of milk – and so on. Stir well and continue on with step 4 above. 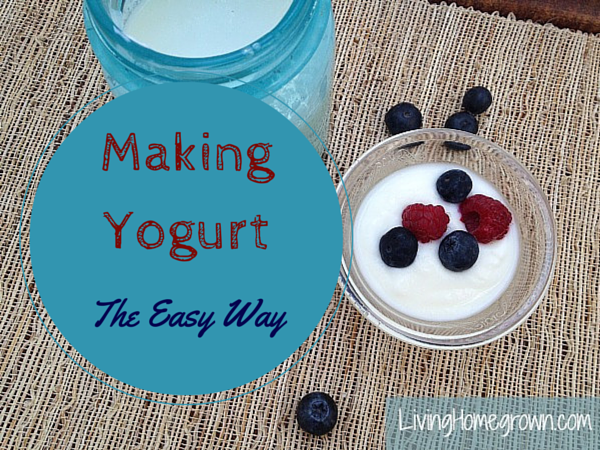 Make a fresh batch of yogurt just before leaving on your trip. Have a friend keep the yogurt starter and remake a batch for you while you are gone. Can I Sweeten or Flavor It? Yes! I use maple syrup. But you can stir in fruit, vanilla, honey or whatever you want. But first, always pull out some unsweetened, unflavored yogurt to use for your next batch. 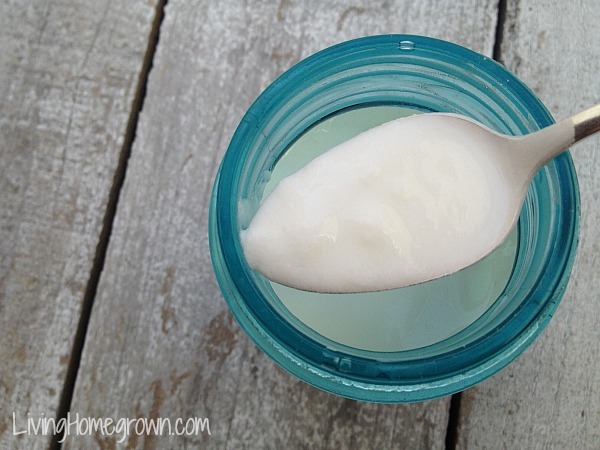 Do you make yogurt at home? Think you might try? Enjoyed your post, but would like to try it with almond milk. Is it possible to share those extra steps. I will go into more detail in the post. But this is a great place for you to start. Enjoy! I really enjoy your posts! So many interesting tips and facts in all the the things that i love, like chickens and canning.. Now i might try maki , g yogurt!! That greek yogurt is so expensive in the stores. It is expensive. I love that we have choices and can may different kinds of yogurt so easily. They are SO yummy! THANK YOU. I am so grateful you wrote this. I had gotten a viili starter and couldn’t figure out where I went wrong. I even talked to the customer service people at Cultures for Health (who, for the record, are AWESOME), and I still didn’t know where I went wrong. But reading this, I see it now: I bought ULTRA pasteurized organic milk. Shoot! Now I feel silly. I picked it up at Target and they didn’t have any that wasn’t ULTRA pasteurized so I went with it in a pinch. I’m so glad to know where my mistake was so now I can buy different milk and give it another go-’round! Thanks again! Lol! That was going to be my question! What if you don’t keep your house warm enough for it to culture? I’ll just find an electronic device (and keep the cats away). If you are near a Trader Joe’s market, they have pasteurized, non-homoginized milk now. It’s much more delicious. The cream actually rises to the top. Just like old-fashioned milk we used to get from the milkman. I have been thinking about making yogurt for a while now. You make it sound pretty simple, I think it is time to try it! Thank you for all the information, armed with thatI think I can begin making my own yogurt! Awesome Paula – wait until you taste it. It is better than store bought to me. I’m excited to try this yogurt recipe. I’ve tried the ones where you make it in your crock-pot. My husband and I didn’t like the way they turned out. YAY! I’ve been making yogurt in my crockpot but we go through so much of it, it was getting to the point of needing a second crockpot. Your post is perfect for our crazy yogurt-eating needs. My kids love having it for breakfast with granola. The caning jars are the perfect size for their breakfast. Thank you! I only have raw cow’s milk. Will that work the same as pasturized? It works a little bit differently with raw milk. The issue is that raw milk has more bacteria and that competes with the yogurt culture. You get a thinner yogurt and you can’t re-culture well directly from the raw milk. But what you can do is keep a separate starter healthy that is made from pasteurized milk. (You can pasteurize a cup of your raw milk, or use store bought) Then you pull from that and add to your raw milk to culture raw milk yogurt. I can’t speak to how well this works because I have not done it myself. Hello, Love the idea of making yogurt with my Goat milk. Could you share a link with those instructions? Thanks!! *This* is the post I’ve been waiting for. I love the idea of not needing to heat the milk because I tend to get distracted and let the pan scorch. Does straining help thicken this type of yogurt or will it be thin no matter what? Straining helps a little bit, but it never gets as thick as Greek yogurt. What is the protein content? Is it higher than store bought yogurt? Store bought Greek yogurt has around 22 grams, traditional is less than 10 grams. Good question Cynthia. I wish I knew an exact answer for you. I’m not sure of the exact protein content, but I can tell you this. The bacteria converts some of the milk to add more protein. And I would guess that some bacteria do a better job than others. I’m just not sure which cultures do the best job or by how much. So I suppose that if you start with a milk with the highest protein, you would get a few more grams/oz in your yogurt. And that is about the most I can tell without testing. Start with a whole milk with high protein and go from there. I hope that helps. The kids like some flavor if they want the fruit on the side or to make it with a parfait. I was wondering if a flavored extract could be used? My son loves lemon yogurt. I might try it and see. I wonder if the alcohol level in it would kill the cultures or if I should use a juice? Thoughts? I am not familiar with Yogourmet, but I checked the website. It is a freeze dried yogurt culture with dried milk and a little bit of sugar mixed in. What I could not tell however, was if you had to use a yogurt maker (with heat) or if it is cultured at room temperature. Since it is a branded product, the culture they use is proprietary info. I suspect it is a blending of more than one culture – their own secret formula. If it is cultured at room temperature it could have Villi or other heirloom mesophilic culture in it. But I’m not sure which ones they are. I also purchased Yogourmet probiotic yogurt culture (freeze-dried) and the package says ingredients are skim milk powder, active bacterial culture (L. casei, B. longum, L. bulgaricus, S. thermophilus, L. acidophilus). On the front of the package it says “contains Casei, Bifidus and Acidophilus.” Is this considered mesophilic? The L. casei is a strain used in vegan cultures and is a direct-set culture and also thermophilic. Direct set cultures not reusable. It means you add it every time you want to make yogurt. The advantage of direct set cultures is that you can use just about any milk you want. I also just read that direct sets are always thermophilic. I could not find anything on the B.longum in my yogurt books. But I would say that since it is a freeze dried product with at least 4 thermophilic strains, it is considered thermophilic. Thank you. I did inquire directly with the company and they were prompt in their reply – it is thermophilic, but they sent instructions on how use with heat, so I will try it with my Excalibur food dehydrator which keeps a constant warm temp. I do think I’ll be ordering the mesophilic starter you recommend. Love your podcast! Also good to know they answered you so fast on the type of starter it was. Thanks for letting me know. I just purchased a Greek yogurt starter culture. Does this method work for making Greek yogurt as well? A lot of people don’t realize that you can make “yogurt” at room temperature using probiotic capsules. This is how I test probiotic capsules to see if they still have enough living bacteria in them to do any good. If they can separate milk into curds and whey in 2 to 3 days just sitting out on the kitchen counter, then they are still alive. I then eat the “yogurt” and it is just fine. I just pour a small glass of milk and add the contents of a probiotic capsule to it and then cover it with a cloth to keep insects from getting in to the milk and set it out on my kitchen counter for a few days. I use ordinary milk right from the store, and I take it right out of my refrigerator without heating it or anything like that, and it works great. Hi, Wonder if you can help. A friend gave me a “room temp” culture; they made some reference to the Sherota (Yakalt) strain. They washed half a dozen nodules of culture and put them in milk, telling me to ensure air could get to it. After 48hrs at room temp it smells healthy, although it remains very thin (as you advised). Question: Do you know which culture strain has white “nodules” which you wash and place in fresh milk (rather than a spoonful from the previous batch). The nodules appear to multiply. Thanks for sharing this…. I’m a bit late to the game, but listened back to back to back on a long road trip. I have started making my own and really enjoying it. Can you add honey during the fermentation? Hi Mike – I would only add honey just before eating. Honey has antibacterial qualities that could potentially cut down the activity of your ferment. But there is nothing wrong with adding honey just before you eat it!